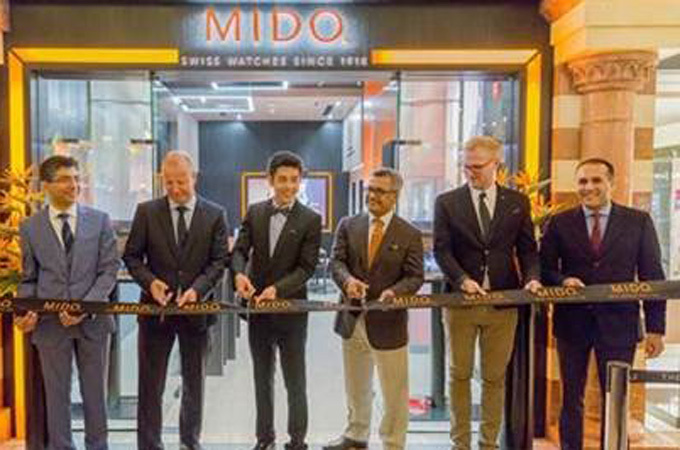 Swiss watchmaker Mido furthered its expansion into the Middle East region with the official inauguration of their store at the Dubai Mall today, also marking the 100th anniversary since the brand’s inception in 1918. The official ribbon cutting ceremony took place in the presence of Franz Linder, President of Mido, together with Rivoli Group representatives and the famous Taiwanese actor and singer George Hu. Taking advantage of this jubilee, the brand not only looked back at its rich history, but also presented a trilogy of limited editions based on the theme of “past, present and future” to illustrate its timelessness and to honour its watchmaking heritage. In 2018, the brand marked its 100th anniversary by celebrating the values that have formed its DNA for a century: timeless design, high-quality materials, and technical innovation. A continuation of the Baroncelli collection, inspired by the Rennes Opera House and its incredibly rich aesthetic appeal and technical mastery. The “Baroncelli Trilogy” unveiled by George Hu embody different key periods of the brand's history as well as its resolutely forward-looking mindset: the years 1918, 2018 and 2118. A nod to the year in which Mido was created, the model embodying the brand’s tradition is produced in a limited edition of just 1,918 pieces. On this model, the case in polished steel with rose gold PVD treatment reveals a delicate polished and lacquered ivory dial. Meanwhile, the stamped hour and minute hands adopt a rounded leaf shape. With its glossy brown crocodile-look strap, this chic and discreet timepiece recalls the enamelled watches of the past to honour Mido's watchmaking heritage. The Baroncelli 1918’s petite complication calibre is particularly dear to the brand, as small seconds were part of its collections from as early as 1934. This embodiment of the timeless elegance of the past is a fitting celebration of Mido’s centenary. Marking the brand's centenary, the Baroncelli 2018 is balanced and contemporary, giving the collection a simple, modern face with its polished stainless steel case and white polished and lacquered dial. Yet it stays true to the brand and its values by retaining the collection’s classic codes in its hands and its shape. The polished stainless steel bracelet with folding clasp also anchors it firmly in the present. This refined timepiece is a perfect fit with our current world.